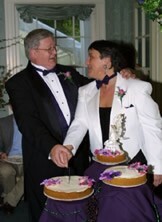 Pat n' Pat met on the Internet in 1999 after both of our spouses died. After suffering such a huge loss we both were in a position to re-evaluate what is truly important in our lives. Independently and together we decided giving back to the community was our priority. We now have a blast working together helping nonprofit organizations of all types to produce Fun, Entertaining and Profitable Fundraising Auctions. Why did we choose doing nonprofit Auctions? Pat n' Pat love to go to Fundraising Auctions and unfortunately (for us, not you) in our 14 years of doing Auctions we have never left without spending money. Pat (the girl) began working with Fundraising Auctions in the mid-1980's as a volunteer Chair for the Oregon Symphony's benefit Auctions. She soon was "bit" by the Auction bug and went on to get her degree in Nonprofit Management and work as an Auction Coordinator. A few years later she became the Director of Development for a major national Performing Arts Organization working with over 300 affiliated nonprofit organizations. After John's death she went to the Missouri Auction School to become a Professional Auctioneer to continue helping nonprofit organizations raise much needed funds. PAT (the boy) spent 30 years as a Hospital Administrator in Los Angeles, Washington and Oregon. It was an Auction winning-bidder experience that brought Pat to Oregon - Ask him about it! Deeply involved with nonprofit organizations Pat serves on the Corbett Fire District Board and recently on the Multnomah County Planning Commission and Cascade Locks Utility Advisory Board. Together Pat n' Pat enjoy vintage automobiles - we both still own our very first cars: Pat (boy) has his 1935 Ford "Sleeper" he got when he was 15 and Pat (girl) has her 1956 Thunderbird her father bought when she was "sweet" 16. As you can probably tell from the pictures on the website Pat n' Pat have acquired a few "toys". 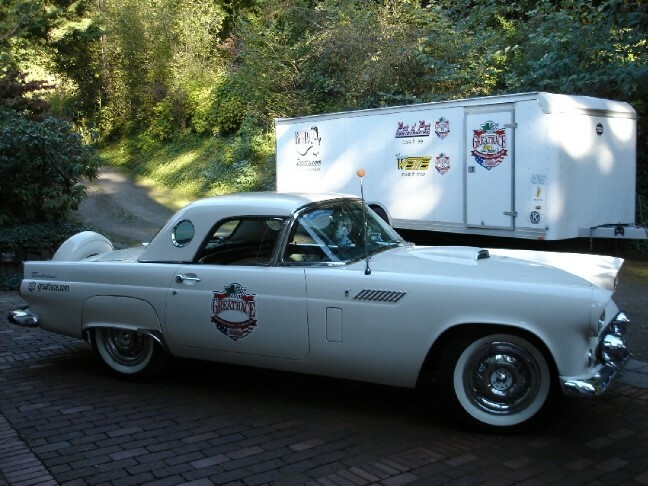 In addition to showing and touring our vintage/Classic Cars every year Pat n' Pat competed for the past 9 years in the "Ultimate Automotive Adventure" - The Great Race - an extreme motorsports cross country 9-Day Vintage Car Time/Speed Endurance Rally. And last, but not least - Pat n' Pat enjoy traveling. In the past 7 years Pat n' Pat have visited over 45 of the United States, Canada, England and Mexico. Pat n' Pat have family in Wisconsin, Virginia, Missouri, Nevada and California - and friends all over the world. Please invite us - we will come!